Boil ackee, garlic and onion in a flavoured stock and make a fine puree along with basil. Mix cooking cream and season with salt and pepper. Mix butter and mince garlic to make garlic butter. Apply garlic butter on the whole wheat bread and toast it. 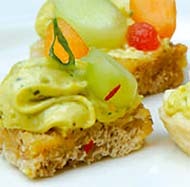 Cut the bread into triangles and pipe ackee mousse on top.